How to do justice to this magnificent palm in just a few words? 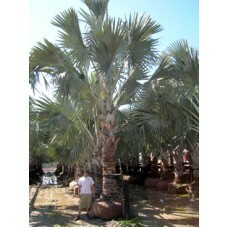 The Bismarck Palm has a full crown of large, silvery-blue, circular, fan-shaped leaves and a tall, columnar trunk. In seedlings and young plants, the leaves are tinged with an unreal purple-red color. Bismarckia develops fairly quickly into a large and stunning tree that is excellently suited for the sub-tropical or tropical garden, for parks, and for breathtaking avenues. It is tolerant of drought and a few degrees of frost and wants a place in full sun, such as it enjoys in the highland savannas of its native home of Madagascar. A Quality Plant has this magnificent palm in many sizes to meet the needs of landscaping professionals. We grow our Bismarck Palms from seed and our seed only comes from the most silver specimen palms. The Bismarck palm has survived temperatures into the upper teens and can handle frost when the fronds are silver. There is certainly a correlation between the silver leaves and cold hardiness. That is why A QUality Plant only grows the most silver. Make sure and leave some space when planting. The Bismarck grows to 20 feet plus across and has giant leaves at maturity. They do work in groupings of three or more for a jaw dropping effect. The Bismarck is temperamental and needs to be prepared for planting properly. This requires a "Hardening Off" of the root system. We will have the palm stable and ready for planting before selling it to you. Once the palm is established, the Bismarck is one rugged palm! Call us today to buy your Bismarck Palm with confidence!